On Radio Live last night, Duncan Garner was chortling with satisfaction at Bill English’s stewardship. His business guests were even more delighted. Andrew Patterson praised Bill English’s wisdom and prudence that had finally undone all the damage of the Clark Labour Government. In a pretty disgusting metaphor, Garner said Cameron Bagrie, the ANZ chief economist, soiled his trousers in delight when he read Bill’s Budget. 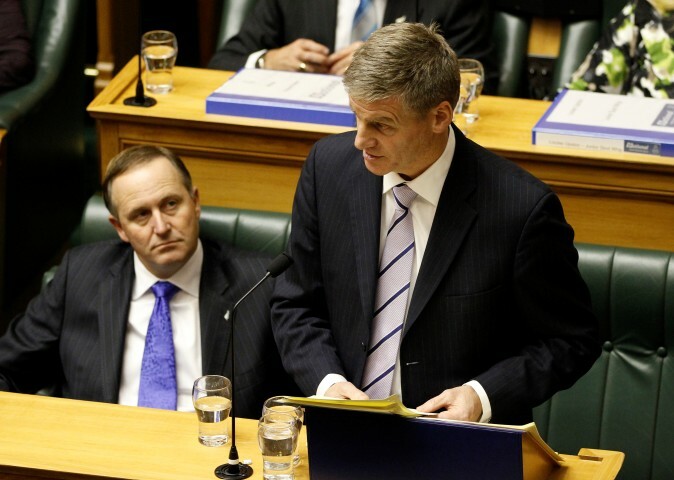 The Budget’s key features include measures to reduce house prices, ACC levy cuts, privatisation of Meridian Energy, support for businesses and for research and development, more money for Christchurch’s reconstruction, and, of course, a surplus – by 2015. It’s clear the Government recognises many areas of weakness facing New Zealand – housing, Christchurch quake recovery, poor productivity (the technical level of the economy) but has no inkling of – or interest in – the storm that is set to engulf the country if Australia goes into recession. “And if I was John Key or Bill English I would hang my head in shame because under this budget 270,000 kids will still be in poverty today, tomorrow and next year”. However, who really expected that the Budget would seriously try to address poverty? $100 million more over three years for home insulation is pretty much as lavish as it gets. That funding is dwarfed by the money going to business “start-ups” ($130 million), or research and development ($566 million over four years, or $141.5 million a year). It is clear too, that this is a pro-business Budget. One of the biggest money movements in the Budget is the slashing of ACC levies by $300 million this year and $1 billion next year. Levies were cut by $630 million last Budget. This is a tax cut that directly impacts on our public health system. ACC levies are deeply resented by businesses, not only because business is philosophically opposed to public healthcare but also because levies penalise bosses for unsafe practices. Accidents at work mean higher levies. What’s most galling about these ACC cuts is that National claimed ACC under Labour was in crisis. Now, five or so years later, it apparently has too much money. The privatisation of Meridian Energy is another gift to well-heeled North Shore “mums and dads”. It will result in higher power prices as shareholders put pressure on directors to screw money out of customers and reduce the ability to respond to any major energy crisis. The measures to address housing boil down to giving property developers a green light by fast-tracking building consents. The result will be overpriced urban sprawl on Auckland’s fringes and cheap and nasty in-fill housing in working-class neighbourhoods. The Government will contribute to this directly – addressing overcrowding in state housing by adding extra rooms – and indirectly by introducing “social housing”, where private landlords receive a Government subsidy to take beneficiaries. This is a windfall for the cockroach capitalist constituency – the “mums and dads” with spare thousands to buy Mighty River Power and Meridian shares. The support for start-ups and research and development are also all attempts to subsidise our failing business sector. Right-wing politicians often boast about the number of small companies there are in New Zealand. In many cases, this is an indictment on New Zealand, not a good thing, as working people are forced into small businesses, such as cleaning contractors, for want of decent, well-paying jobs. These small businesses, and New Zealand’s capitalist class in general, do not invest in research and development. We have one of the lowest rates of research and development spending in the OECD but also – the government share of that spend is among the highest. This is reflected in the New Zealand economy’s falling relative productivity. Where New Zealand once was on a par with Australia, it is now more than 30% behind. It is no coincidence that the average wage rate is also about 30% below Australia. Why spend money upskilling your workers or buying up-to-date machinery that will allow them to do their job better, when wages are so low and you can hire and fire workers at will? Ever since the 1990 National Government, New Zealand has tried to compete internationally on the basis of free trade and low wages. The result is falling productivity. Low wages create a structural incentive against investment. The result is a stupid, venal, and intellectually limited ruling class and small-business class. These cockroach capitalists are unable to face the reality of the social damage inflicted by poverty at home, unable to face the reality of New Zealand’s declining technical competitiveness, and unable to face the reality of the twin-disasters of climate change and the Global Financial Crisis. John Key, the man who made money out of thin air as a currency trader, with his laid-back, lackadaisical style is the hero conjured up by their collective lack of imagination. Commentators who wet themselves over this budget are strange, but more moderate commentators such as John Armstrong, who described this as a “steady as she goes” budget are also wrong. The myth that this National Government is a steady pair of hands, unimaginative perhaps, out of touch with working people and the poor perhaps, but essentially delivering economic stability is badly mistaken. This mistaken view is well summarised in an Otago Daily Times editorial that contrasted Australia’s spendthrift ways with Bill English’s sober budget. Some 400,000 New Zealanders are in Australia – including 20% of all Maori. An economic meltdown in Australia that sees even the smallest fraction of that workforce unemployed and returning will create an economic crisis that will expose the Key Government as snake-oil merchants and charlatans.